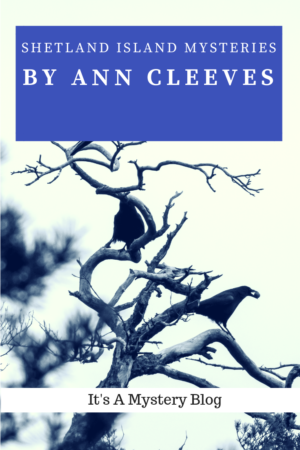 Ann Cleeves is a prolific English author who has written four separate mystery series. Her first featured amateur sleuths and bird watchers, George and Molly Palmer-Jones (started 1986). The second series featured Inspector Ramsay and was set in the English county of Northumberland (started 1990). The Vera Stanhope series (started in 1999) and The Shetland Island Mysteries (started in 2006) have been turned into television shows, Vera and Shetland on BBCFirst (see trailer below), respectively. Detective Inspector Vera Stanhope is not the typical heroine. She is middle aged, she works all the time, and she doesn’t make friends easily. On the other hand, she is good at her job. These novels feature Detective Inspector Jimmy Perez. The first in the Shetland Island Mysteries series, Raven Black won the coveted Dagger Award. Although this novel says “A Thriller” on the cover, it really falls neatly into the mystery category (for reasons I can’t give away without spoilers). One thing I really like about the book is how Cleeves builds her characters. She gives little in the way of physical description, but instead we get to know them in small increments through thoughts, actions, and even reactions from others. She reveals her characters as if by painting, by laying down a few strokes of color at a time. Using this technique, she builds the picture slowly and with a deft touch. For example, we meet Magnus first. We begin to suspect he is elderly because his feet are stiff and achy and because he dozes while waiting. A short time later we learn more, that people laugh at him and call him slow. When two young girls arrive, we see from their mix of fear and giddiness that he’s ostracized and lonely. When we meet main character Inspector Perez, his physical description is distorted because the observer is in a vehicle. She saw the face of a man, the impressionist image of a face, blurred by the mist and muck on the glass, wild black hair and a strong hooked nose, black eyebrows. The dialogue is sparse, except the times when Perez interviews someone. Even then there are breaks in the conversation filled with descriptions and observations. The low key dialogue helps create an atmosphere of silence and adds to the austere feeling. The setting is well done and it is interesting to learn about the people or the Shetland Islands and their culture. None of it seems extraneous. For example, Cleeves uses a community festival held every year in Lerwick, Shetland called Up Helly Aa to help move along the plot. Raven Black is beautifully written. Because the author combines realistic characters with a novel setting and a compelling plot, the reader is riveted right to the end. I definitely want to read more of this series and more novels by Ann Cleeves.